Two of the most common features of training pro­grams of swimmers competitive are the periodiza­tion of training volume and intensity and the transition from training to racing. A periodized train­ing and tapering program is based on the principle of overload—recovery—peaking. This principle forms the basis of preparing swimming training programs with the aim of increasing the level of competitive performance. A fundamental principle of preparing athletes is that periodization and tapering applies equally to all the different aspects of fitness, such as endurance, speed, strength, flexibility, and power. The training program must provide an overload (stimu­lus) to force the body to adapt to a previously un­encountered level of stress. After sufficient application of the stimulus (in terms of magnitude and fre­quency), a period of recovery and regeneration will allow residual fatigue to dissipate. If the processes of overload and recovery are managed correctly a pe­riod of super compensation will occur so that per­formance is elevated to a higher level for important competitions. Periodization involves dividing the training plan into smaller parts using the terms mesocycle, macrocycle, and microcycle. These terms are used to establish a hierarchy of training within the overall program. This approach is well established in practice in a wide range of endurance and power sports. Mesocycle refers to a long-term training phase last­ing several weeks to months. In swimming this rep­resents the entire 12-20-week preparation for a ma­jor national or international competition. Most com­monly, there are two mesocycles a year with peaks for the national swimming championships and then the major international competition (e.g., Olympics, Worlds, etc.) held later in the year (luly-September). The contemporary model of preparing competitive swimmers in a given year is based on the following se­quence of training and competition: preseason, early season, competitive season, taper, championship sea­son, and recovery or off-season. For highly trained swimmers the competitive season usually takes the form of domestic competition or international com­petitions. The champi­onship season typically involves the national champi­onships, often doubling as the national team selection trials, and then the major international competition for that particular year. Once the competition schedule has been estab­lished, the training plan can be prepared with the goal of maximizing the performance of the swimmer for the competitive and championship seasons. For in­ternational swimmers, the entire season is typically 44-48 weeks in length with a short break permit­ted after completion of the championship season. The length of each of the different training phases will vary according to the individual circumstances of the swimmer, team, and coach. In recent years, the international swimming calendar has become more crowded and as a consequence the annual train­ing plan has become more fragmented and com­plex. 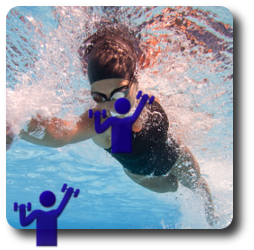 Training by competitive swimmers typically consists of repeated bouts of shorter or longer intervals in a short-course or long-course pool. Intervals span a con­tinuum from longer slower intervals (50-1600 m for developing aerobic or endurance fitness) to shorter faster intervals (15-200 m for developing anaerobic or race pace qualities). The basic prescription of in­terval training can be simplified to four primary vari­ables: (i) the number of intervals or repeat efforts, (ii) the length/distance of the interval (15 m to con­tinuous swimming), (iii) the intensity (i.e., pace or velocity) of the interval, and (iv) the rest period be­tween intervals (variously formulated as the cycle time or rest period). Preseason training commences from the low base of fitness maintained during the off-season. Swimmers typically start the preseason phase with a single ses­sion per day and gradually increase the number of ses­sions over the first few weeks. A graded increase sees the frequency of training increasing from one session per day, to three sessions over 2 days, and eventually to the traditional two sessions per day format followed by the majority of high-level swimmers. The main features of the early-season phase are a mod­est training volume to start, small 5-10 km increases in volume per week, low initial training intensity, and dry-land conditioning including flexibility, circuits, weight training, and other games and activities, to im­prove the overall sport abilities of the swimmer. Af­ter several weeks there are further increases in train­ing volume, a graduai introduction of higher intensity aerobic work to the level of the lactate threshold, and emphasis on skill and technique development before moving to the faster training speeds. In simple terms, training volume elicits improvements in general en­durance fitness while training intensity develops the specific fitness required for racing and competitive suc­cess. The later weeks of the early-season phase focus on continuing development of the lactate threshold (endurance fitness), maximal oxygen uptake (maxi­mal aerobic) and race pace training capacities, ongo­ing manipulation of training volume and intensity to maintain improvement, an individualized approach to volume, intensity and recovery, and refinement of skills particularly at race speeds. The tapering strategy used by many swimmers to opti­mize competition performance has been defined as "a progressive non-linear reduction of the training load during a variable period of time, in an attempt to reduce the physiological and psychological stress of daily training and optimize sports performance" (Mujika & Padilla 2000). The aim of the taper be­fore the main competitions of the season is to elicit substantial improvements in performance. These per­formance gains have been variously attributed to in­creased levels of muscular force and power (Trappe et al. 2000), and improvements in neuromuscular, hematological, and hormonal function, and/or the psychological status of the swimmer (Mujika & Padilla 2000).